When it came to designing our first baby girl room - I wanted a nursery that matched my husband and I's personality/style and offered a neutral canvas for the possible next baby. The colors I chose were Turquoise, peach and coral - with burlap accents. Laken means "lady of the lake" so we wanted to bring in the calming elements of the sea to surround her. I spent a long time thrifting and DIY crafting to make this room unique. We started with the Cedar plank wall - I found a GREAT pinterest blog from Creative Little Daisy that I used and only modified a little: (http://creativelittledaisy.typepad.com/creative_little_daisy/2011/12/palletless-pallet-wall-how-to.html) With some stain, a little artistic eye and a nail gun the wall went up like a piece of cake! I then upcycled the white curtains that were already in the room by adding Burlap ruffles from some burlap table runners I had made for my best friends wedding. Next was the Upcycled Family cedar chest with cushion - I went to fabric.com and ordered some swatches and decided on the sea coral piece. I sanded and stained the old chest with a grey color - turned out perfect! I had found a ton of bedding on Etsy that I loved and decided to attempt on my own. I ordered again from fabric.com the peach and tan fabric as well as the bumper pad set. I followed the instructions included with the pads but modified the ties and added a side of ruffles - Beware because ruffles are the devil I decided. For the crib skirt I found a 1.50$ used skirt at my church's Bargain Box - bleached it and added three layers of ruffles to match the other fabrics. The crib is the Lauren Graco Crib from Target.com - Perfect size! For the changing table I thrifted until I found this perfectly restored TV media cabinet that I knew would work by adding a changing pad from Target on top at Ava's Attic in Destin, FL (http://www.shopavasattic.com/) - I also found an old brown rocker at the same location and restored that myself. Adding a down pillow chair pad for the back in coordinating fabric with the bedding. I now needed more shelf storage, so I went on a hunt for a cubby hole bookshelf - I wanted something original but didn't want to build it myself. A wonderful Antique Store in Miramar Beach, FL called Brocante (https://www.facebook.com/brocantefl?ref=stream&filter=2) was where I finally found the perfect shelf as well as the turquoise coral rug and the antiqued white nightstand. The monogram above the crib I ordered from Etsy and painted a coral color to match the room - I mounted it on a burlap wrapped canvas and attached rope to it. I mounted a real dock boat anchor from Home Depot on the wall to go with the theme. I LOVED the swing shelves from Pottery Barn Kids but they were very expensive and I was pushing my budget - So I found this blog on project nursery (http://projectnursery.com/2011/08/diy-wall-decor-knot-your-typical-shelf/) changed it up a little by using actual boat anchor cleats to hold up shelves. Start your thrifting/antiquing hunt early - the more you can re-visit the store the better chance you have of finding exactly what you want! If you are planning on DIY'ng a lot of items - START early - The rounder you get, the harder it is! I sooo love your pallet wall! Makes me want to do the same thing to my wall asap! I love it, too! 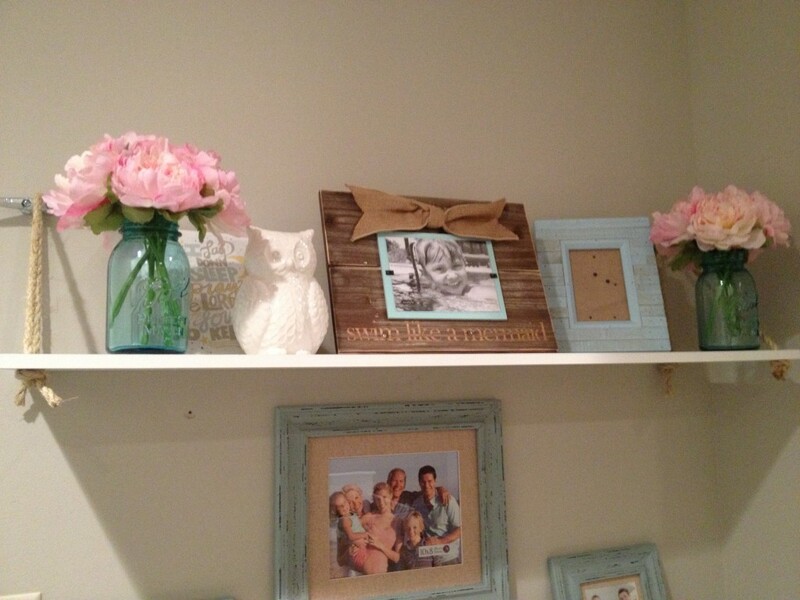 And all those vintage wooden frames.